The loquat tree is an evergreen that can reach 30 feet tall with slim leaves 5 to 12 inches in length. With mild winters, it blooms a white, sweet-smelling flower with five petals that each form clusters of 1-inch oval fruit. Grafted loquat trees produce fruit in three to five years while it can take up to 10 years if loquats are planted from seedlings. Jelly and jam can be made from loquat fruit. It can also be cooked with sugar and spices and served as a sauce over ice cream or as a pie filling. Try the recipes included with this article this summer or eat it fresh mixed with other fruits. Texas loquats ripen in late spring or early summer after a spring season of blooms. The loquat clusters shown here are in various stages of development with the larger ones ripe and ready for harvest and the smaller ones needing more time to mature. Sometimes we fail to see worth and beauty of everyday plants around us. One such tree lived in my yard 10 years before it became one of my favorites. I bought my loquat tree at a nursery bankruptcy sale. After planting the tree, it was left to the elements for years until I retired. Then, I was able to spend time with my yard and garden. I learned more about my plants and struggled with droughts, weeds, watering and moving trees and plants to desirable locations where they would thrive. South Texas summers take a toll on all plants, but my loquat has survived in spite of my previous limited time - and the weather. 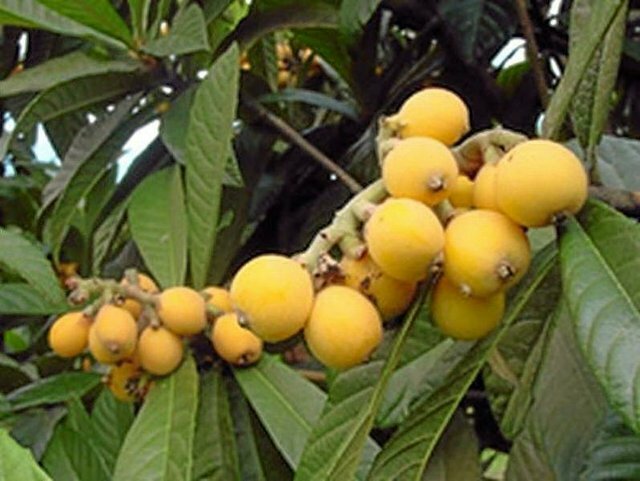 Loquat trees are native to Southeastern China and southern Japan. The loquat, or Japanese plum, has been grown there for more than 1,000 years. Chinese and Japanese loquats are the two main varieties. Loquats are related to the apple, pear, peach and nectarine families. These trees are evergreen and can reach 30 feet tall. The long, slim leaves grow from 5 to 12 inches long. The underside of the leaf is brown and velvety. Each sweet-smelling, white flower has five petals that form 1-inch oval, yellow fruit clusters. The white, tart fruit pulp has a plum-like consistency with three to five seeds. Loquat trees grow best in areas with short winters and above freezing temperatures. They can withstand freezes of single digits but will not produce fruit or flowers if temperatures fall below 27 degrees. Temperatures in the 90s can also affect loquat foliage and fruit growth. Past winters were brutal to area loquat trees, although this year was not as bad. There were only a few blossoms and no fruit the past several spring seasons. I look forward to what this year brings. Plant loquat trees in full sun, 30 feet from other trees and buildings. They live with moderate amounts of water, so they are a good choice for our area. Loquats grow well in different soils with good drainage. Prune loquat trees after fruits are gathered to reshape and encourage proper growth and desired height. Grafted loquat trees bear fruit in three to five years, compared to eight to 10 years if planted as seedlings. Bee pollination and rainfall is important for a successful fruit crop. Texas fruits ripen usually in late spring or early summer or three months from flowering. Loquats can be served fresh, dried, stewed, spiced or cooked into jams or jellies. Eat loquats fresh with bananas, oranges and coconut as a quick summer dessert. 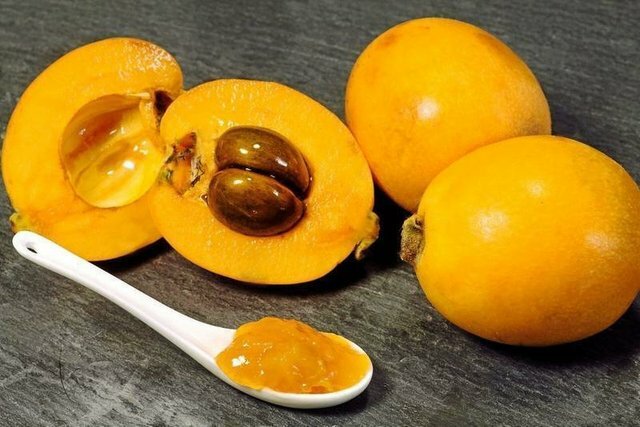 When cooked, with sugar or spices like cinnamon, cloves, lemon and vinegar, the loquat sauce can be served over ice cream or as a pie filling. Loquats last a couple of months when placed in cold storage. Bitter loquat seeds consumed in large amounts are reported to be poisonous due to a form of hydrogen cyanide present in the plant. Caution should be taken with intake of them. My research indicated that loquats have been used for medicinal purposes in the Far East for many centuries - and for various ailments. This included loquat flowers used as an expectorant to relieve coughs. The fruit and leaves are reported to relieve digestive and respiratory problems and act as a sedative product that wears off in about 24 hours. Loquats are rich in vitamins and minerals. Some researchers attribute loquat leaf teas as helpful in treating cancer. Of course, you should always consult with a medical professional. Use sparingly and don't just experiment without consultation. I look forward to seeing my loquat tree change with the seasons. I use its beautiful leaves to decorate during the holidays or any celebration and preserve the fruit for family and friends. The flowering loquat tree growing in my yard creates a fragrant aesthetic environment and under normal winter weather conditions will produce enough golden fruit to keep me busy canning all summer. Take inventory and learn about your trees and plants. It saves time, energy and money. You may be surprised at what you find! 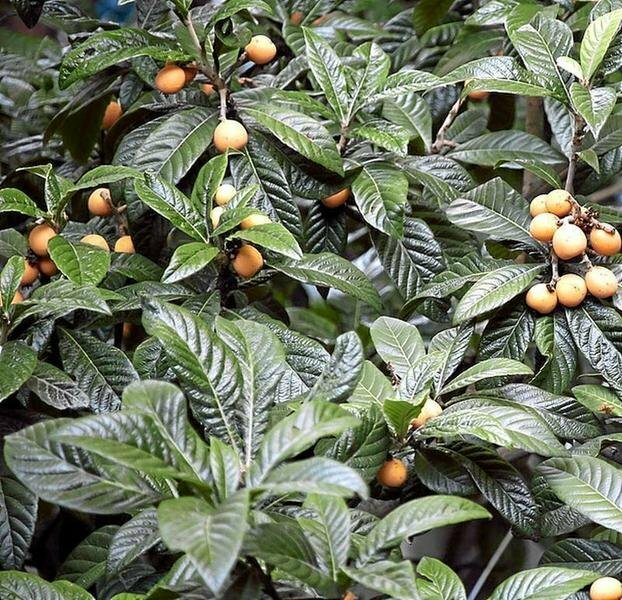 When asked about the lovely loquat tree, I am excited to share my knowledge and a jar of jam or jelly. The Gardeners' Dirt is written by members of the Victoria County Master Gardener Association, an educational outreach of Texas AgriLife Extension - Victoria County. Mail your questions in care of the Advocate, P.O. Box 1518, Victoria, TX 77901; or ﻿vcmga@vicad.com﻿, or comment on this column at ﻿www.VictoriaAdvocate.com﻿. Wash fruit, cut off both ends and remove seeds. Place in saucepan; add water to barely cover fruit. Cook on low 10 to 15 minutes. Strain through jelly bag. Do not squeeze bag as the juice will become cloudy. Add pectin to juice and stir well. Let mixture come to rolling boil stirring to prevent sticking. Add sugar and return to a rolling boil for 1 minute. Pour into hot jelly glasses and seal. Wash fruit, cut off both ends and remove seeds. Place in saucepan with water to cover fruit and cook slowly and stir until soft; mash. Add pectin to fruit; stir well and bring mixture to a rolling boil. Add sugar; return to rolling boil for 1 minute. Pour into sterile jars and seal. Copyright 2012 VCMGA. All rights reserved.